How many of you have peers that can offer you support to develop as an artist? Artists often work in solitude and miss the opportunity for meaningful connections with other artists. Being part of a community of artists can change the game for a practicing artist: all of a sudden you have people who can offer support, accountability and useful feedback about your art. In any discipline, if we surround ourselves with people who hold us to a high standard, perhaps even higher than we feel ourselves capable of going, we reach further than we ever expect we could. Today, discover 10 strategies to seek out and develop your own community of like-minded creatives. Creating a MeetUp in your area may help you find the like-minded artists you seek. (1) Find a meet-up or start one for artists in your hometown. Meet once a month for a group critique. (2) Find a FB group that aligns with your creative goals and participate in the group. See what like-minded people you discover in there and develop those connections. I recommend Magically Mixed Art Community (NOTE: this group has since retired) and my own group: Becoming Artist Strong. (3) Sign up for classes at a local art center or community college: see what other art students are there. What are they doing? What do they want for their art? (4) Read articles and blogs from artists you admire online. Reply to the emails they send, especially when they ask questions. Offer support that will help them: articles, ideas, think: how can I help this person? Develop a genuine connection by showing your honest interest and intention. (5) Choose instagram and an art hashtag that aligns with your artist medium. Begin doing the related challenges and talking about them. See who else shows up in your feed. Connect. A few hashtags worth checking out are #artistscommunity and #artistsofinstagram. (6) Try to connect with one new artist each time you go to an art show/art fair/etc. Ask them questions about their art and see how it helps inform yours. Follow up with an email reminding them of meeting and make an effort to develop the connection. (7) Offer a local art class that let’s you teach an art based skill you know. See what you learn from teaching others about your art, techniques, and process. (9) Make a list of artists you admire. Post images of their artwork all around your creative space. Read their biographies. Watch documentaries about them. Visit their art in museums online and offline. Immerse yourself in their world. What information do you learn? How can you apply it to your art? If you want to raise the standard of your creative practice, finding like-minded artists to share ideas, garner feedback and offer accountability is your solution. (10) Create a closed FB group for you and your art friends. Agree to group expectations for critique. Post artwork in the space to get feedback asynchronously. Create accountability by sharing your artwork and your anticipated deadline. Ask your friends to hold you to it. You are the sum of the five people you spend the most time around. Who are they for your creativity? Is it time to raise the bar? 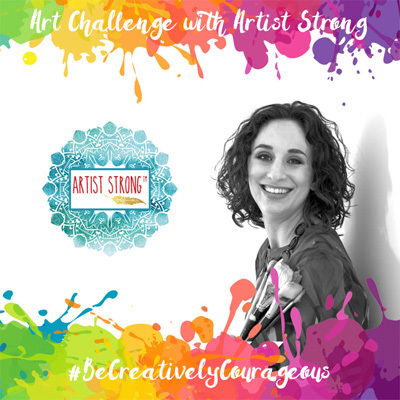 BE COURAGEOUSLY CREATIVE: Coming this fall, I’m creating a special space for artists seeking to raise that bar. If you want to be part of a community that lifts you up, celebrates your artist growth, learning and success, that will offer feedback on your art and hold you accountable to your creative dreams. Sign up here. Be the first to know. Sounds like you are doing “the good work” Linda! Thank you for sharing I’m sure many relate! Carrie, Thank you for this article … l tend to be one of those artists that work in solitude and know I would benefit from being part of a supportive group of like minded artist. I need to work on feeling more comfortable sharing and not comparing … which sometimes keeps me from sharing ! Robin, you are certainly not alone in feeling this way! It’s hard not to compare and to be comfortable sharing. It takes time to cultivate trust and connection with people to really be able to tune into good feedback. It also takes some practice offering and receiving feedback in the right kind of community to integrate it into our lives. If you can find those right people, that’s a huge first step forward in feeling safe enough to share. Thank you for reading Artist Think! Thank you Carrie for your inspired words. I have been given the opportunity to be artistic in a sober way that I have always wanted to do. I do tend to work alone when either writing, drawing or building a new creation. I would like to find out how to be to able to tap into a wider audience on the internet so that I can connect with other like-minded people. John you are most welcome. I work alone too. But there is something to be said about sharing our work as it gets closer to completion with like-minds to get amazing feedback and maybe more importantly, camaraderie! 🙂 I’m creating an online community for exactly this reason. We deserve it!